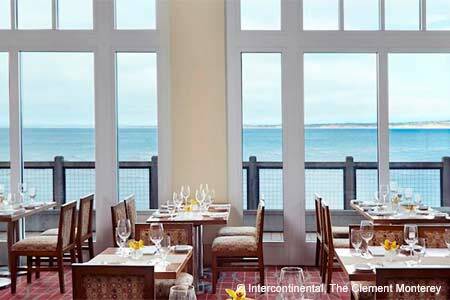 Locally sourced food is turned into flavor-forward dishes at this Cannery Row gem with views of the Bay. : Matt Bolton’s trademark approach to food --- source it locally and let its true flavors shine --- is on display with his menu at The C Restaurant & Bar. Although the restaurant still features sustainably sourced seafood, there are delightful alternatives, such as savory mushroom risotto with locally foraged chanterelles. Bolton's ravioli shines, with rich butternut squash filling and the satisfying crunch of toasted hazelnuts. Crab cakes are devoid of filler and come with a sweet-tart red pepper rémoulade that highlights the sweetness of the crab meat. Seared day boat scallops with caramelized fennel, Dungeness crab whipped potatoes and blood orange emulsion also beckon. The fruit tart, with a crumbly oatmeal crust and pear filling and its Calvados and honey sauce, is a not-too-sweet finish.